Cantinflas in a portrait still from Pepe (1958). Cantinflas is, without question, the most famous movie personality to emerge from Mexico. Assuming a persona similar to Charles Chaplin's "Little Tramp" character, Cantinflas starred in many Mexican comedies, then branched out to making a few films in Hollywood before returning to his native roots for his films. Born into the large family of a poor postal carrier, young Mario grew up in a tough neighborhood where he developed a verbally complicated wit to avoid scrapes with the local toughs. After considering a career in medicine and boxing (! ), he recognized his comic skills, gravitating toward a circus tent show and thus began his showbusiness training. He made up the name "Cantinflas" for a stage name, so that his parents would not know he was performing in such a lowly occupation. First with the Ofelia circus, where he was a dancer, to the Valentina circus, where he met and married his wife, Russian immigrant Valentina Ivanova Zubareff in 1936. It was in these circuses that Moreno developed his character: poor, baggy pants, unusual mustache — The Tramp, only different. After making several short films in the mid 1930s, Moreno was receptive to forming a partnership with producer Santiago Reachi. Their first film together was the short Siempre listo en las tinieblas - Always Ready in the Dark (released in 1939). Once his persona on film solidified, it did not take long for Cantinflas to become a headliner in hit comedies, beginning with Ahí está el detalle - Ahh, There's the Rub (released in September, 1940), still considered one of his best films. More shorts with producer Reachi followed before a double role in his next feature, Ni sangre, ni arena - Neither Blood Nor Sand (released in May, 1941). Cantinflas and Reachi enjoyed great success with El gendarme desconocido - The Unknown Policeman (released in October, 1941), Los tres mosqueteros - The Three Musketeers (released in August, 1942), El circo - The Circus (released in March, 1943), Romeo y Julieta - Romeo and Juliet (released in September, 1943), Un día con el diablo - One Day with the Devil (released in November, 1945). All of these films were distributed throughout the Spanish-speaking world, making Cantiflas one of the biggest draws in cinema. Moreno became active in organized labor in the Mexican film industry, becoming president of the guild for perfomers, the Associación Nacional de Actores, and was the first secretary general of the first trade union among all film workers, the Sindicato de Trabajadores de la Producción Cinematográfica in 1944. After the war, a co-producing deal with Columbia Pictures in Hollywood secured finance and distribution to make even more hit films: ¡A volar joven! - Youthful Flyers (released in December, 1947), El Siete machos - The Seven Men (released in May, 1951), El bombero atómico - The Atomic Fireman (released in September, 1952), and El señor fotógrafo - Mr. Photographer (released in September, 1953). Many of these films were directed by Miguel M. Delgado. Cantinflas had refused several offers from the Hollywood majors, but when Micheal Todd came along with his first Todd-AO 70mm film, Around the World in 80 Days - La vuelta mundo en 80 dias (released in October, 1956), he offered Cantinflas top-billing in Spanish-speaking markets. The film was so successful that Columbia began to handle distribution of the Cantinflas pictures throughout the world, as well as to finance the extravaganza Pepe (released in December, 1960). After the film's west coast premiere the night before, Cantinflas dropped in at the Chinese to make his imprints, and flew home to Mexico City the next day. But Pepe's disapointing box-office take convinced Moreno that Cantinflas would forever remain in his native land of Mexico, turning in films like El analfabeto - The Illiterate One (released in September, 1961), El Padrecito - The Little Priest (released in September, 1964), Su excelencia - Your Excellence (released in May, 1967), Un Quijote sin mancha - A Quixote Without La Mancha (released in September, 1969), Don Quijote cabalga de nuevo - Don Quixote Rides Again (released in May, 1973), and El ministro y yo - The Minister and I (released in July, 1976). His final film was El barrendero - The Sweeper (released in May, 1982). After his retirement, Moreno lavished his time and money on Catholic charities, making for him another legacy among the Mexican people. A life-long smoker, Moreno died of lung cancer in 1993 in Mexico City at the age of 81. His death was noted by a moment of silence in the U. S. Senate. 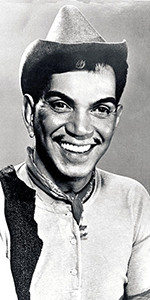 In 2014, a film biography Cantinflas was released (which had its U.S. premiere at the Chinese on Wednesday, August 27, 2014), with Oscar Jaenada in the title role. Grauman's Chinese Theatre, Hollywood, California. Cantinflas Forecourt ceremony, Monday, December 28, 1960. 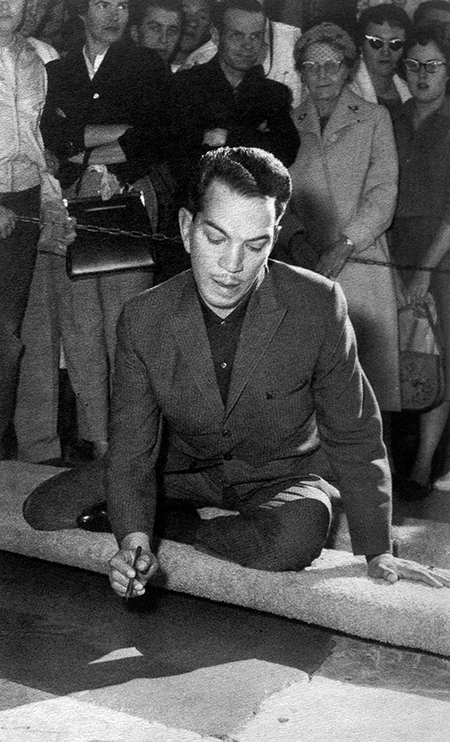 Cantinflas begins to sign his name in the cement.